Now that’s a lot of Apples, a photo by tf_82 on Flickr. 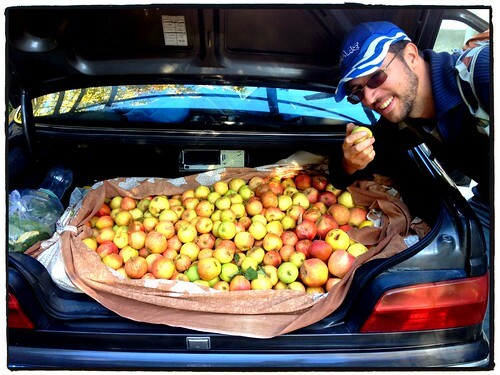 Went apple pick­ing just out­side Shi­raz. When the famous grape is unavail­able, apples are the next best thing. This entry was posted in Iran, Street Photos on 30 October, 2013 by Tim Fisher. Nice haul guys, that’ll keep the munchies away. If you want a vari­a­tion, put them in a can, leave it on the engine & an hour later, good old fash­ion tour grade apple sauce… or ya, a stove is bet­ter.… glad to see you’re doing well there on the amaz­ing journey!! !